As I get older my taste for clothing changes. I still like to look cute and wear younger styles but I also want comfort at the same time. Long gone our the days where I will go through 8 hours of torture all in the name of fashion. Free Country reached out to me last month and offered to send me a new swimsuit so that I could try it out. I was really excited about working with Free Country because their swimwear is really cute and allows you do other things like playing volleyball on the beach or water-skiing without the fear of your suit falling off. Free Country has been one of the leading online retailers of active wear and casual outwear since the early 90’s. Not only are there clothing comfortable and fitting, but they are designed to be fun and fashionable. They have active wear for all seasons including summer. When looking through suits that would fit my style and need I decided to go with the Totally Tubular Sport Back Tankini and Woven Board Shorts. The suit is very comfortable but most importantly, it holds everything in place where it’s suppose to be. The top has a bra built inside with soft removable cups. I love the sport back! It’s like a tank top but at the same time it feels sporty. I really like my new swimsuit and have already worn it several times over the past few weeks. If your in the market for a new swimsuit or other active wear check out Free Country. They have a great selection of clothing at reasonable prices. For more information you can visit http://www.freecountry.com/. adore the colors! I still haven’t purchased a swim suit yet!! That’s definitely a swimsuit I would wear and actually feel comfortable wearing. 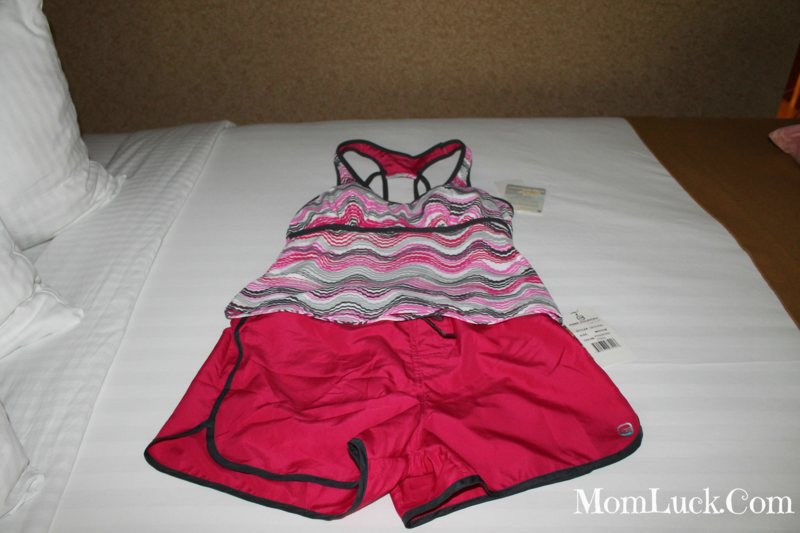 I love the idea of a swim suit and active wear in one! I will check out Free Country. Such a fun swim suit. I love the shorts! I like that style… modest, but not old fartish. I love this style of swimsuit! Super cute and love colors. I really like that swimsuit. I’m sure it’s very flattering. That pattern is adorable! So fun. A swimsuit that doesn’t feel or look exactly like a typical swimsuit? Super awesome!! Very cute! This would be perfect to wear to the splash pad. I’m not comfortable carrying a breastfeeding baby and wrangling a toddler while wearing a bikini! I love that sporty look and the coverage it provides! I love the suit you chose it is cute.